Traditional Irish soda bread is prepared without yeast. Instead, baking soda and buttermilk come together to create a beautifully risen round loaf with its signature X shape cut into the top. 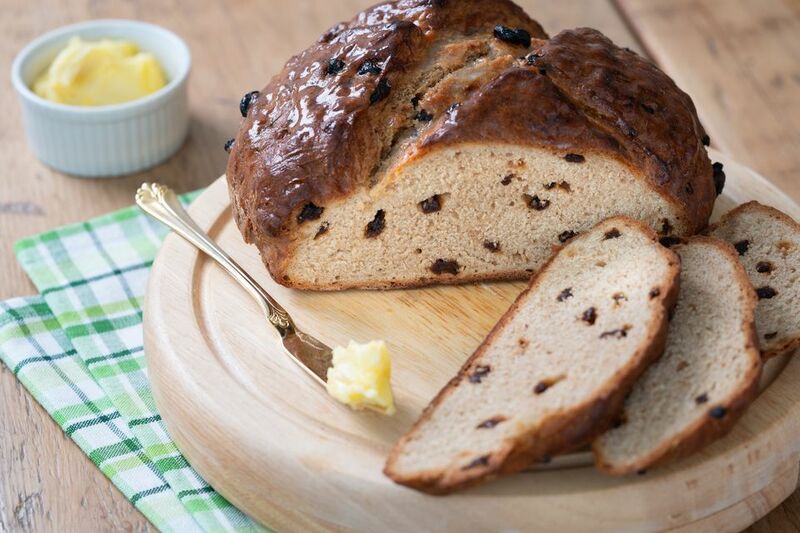 Irish soda bread is well known for this smooth shape with a deep cross cut into the top of the bread. This technique is traditionally known as ‘blessing the bread.’ A sharp knife or bread lame work well to cut the X on top of the bread. It has also been said that a baker should use this same knife or razor to prick the bread in the center of each of the four sections to ‘let the fairies out of the bread’ otherwise these troublesome fairies have been known to jinx your soda bread! This recipe calls for a combination of both all-purpose and hearty whole wheat flour. However all-purpose flour can be used exclusively if you prefer a lighter version of the soda bread. Little dried currants are mixed through the bread dough and you can find one every few bites. Raisins can certainly be substituted if you prefer. Some bakers even like to add a teaspoon or two of caraway seeds into their soda bread. It will be hard to resist diving right into this warm loaf of bread moments after it comes out of the oven. Don’t forget to serve slices with high-quality Irish butter. It is just heavenly. After that first bite, you will certainly be glad you let those fairies out...just in case. When homemade bread is this good, you can't be too careful! Cover a large baking sheet with parchment paper. Preheat the oven to 425 F.
In a large bowl combine the all-purpose flour, whole wheat flour, baking soda, and salt. Stir in the dried currants. Knead gently for about one minute to incorporate the ingredients and begin to shape the loaf. Shape into a ball and place on prepared baking sheet. Pat into an 8-inch circle. Using a sharp knife or razor blade, cut a 1/2-inch deep X in the top of the dough. Bake for about 45 minutes or until golden. Transfer to a wire rack, and brush with melted butter.